THE humble bus has become the subject of a new community art work at Woden Bus Interchange. 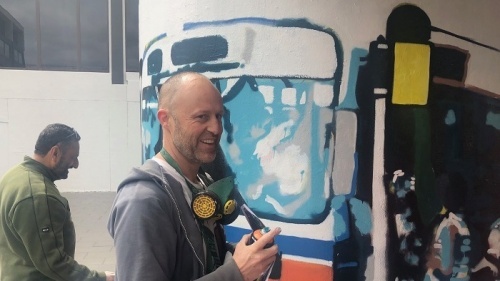 On hand today when “CityNews” arrived was Canberra street artist Ben Reeve, who was busy guiding community artists in donning protective gear and applying the brushwork to series of images he had designed. As part of the ACT government-funded “Streetwise” program, Reeve and fellow-artist Dai Cameron, have been running a series of workshops attended by over 30 older Canberrans and now, the budding older artists were putting their skills to the test. Reeve told “CityNews” that scaling the image up so they could paint it on the wall was “very technical”, but a new spray medium free of harmful pollutants made it easier. On the left of this first artwork—more are planned—was his “spacey” image of an old-fashioned bus leaving Woden, based on a heritage photograph he’d found of the very first bus to do so. In the centre was an abstraction of futuristic Travel, “like a symbol of time travel”. On the right hand side was an image of the “Rainbow Bus”, suggesting tolerance and inclusivity, which, he says, are very important qualities to Canberrans, in his view. The project, Reeve thought, got older people out of seniors centres and into the community, giving them a sense of pride. “This way they can get up and be active,” he said. ACT Minister for City Services Chris Steel said the Streetwise project will provide a number of benefits for this prominent location including discouraging graffiti tagging; enhancing the aesthetics and amenity of the area; and helping to create a more inclusive and welcoming space for older people and others in the community. Previous articleReview / ‘Venom’ (M) 100% overcast – stars there but not visible!